SO if I’m hearing this correctly, the 5th of May is just another day in most of Mexico. It’s primarily celebrated in the United States. Leave it to America to create not only a national holiday for another country, but one whose main purpose is to drink. A word of warning…Try not to drink so much that you wrap yourself around a May pole or something. Anyway, I figure if that’s the way the game is played I am playing to win this year. It’s like a big ole game of Bullsh**when you make something up and try to convince other’s its in fact real and true. Whoever has the most believers in the end is the champ. In an effort to create my own version of a Marguerita I raided the liquor cabinet and got busy playing chemist. I was quickly schooled by my “resident bartender”, who stated I incorrectly added certain ingredients…WHAT? I am not on Food Network here dude, I was in the kitchen having a drunken ball until you, the bar nazi, came in and harshed my happy Mexican mellow…’nough said! Besides we’re not giving awards for best bartender tonight, however I do believe that more people will appreciate a simple recipe for a lime flavored fiesta with easy to follow directions so they can spend less time in the kitchen and more time battering colorful tissue covered animals with a stick for a few meager pieces of candy! I think it’s pretty cool that the good ole US of A recognized another reason to celebrate something, anything and moved forward (probably under the direction of the Hallmark people) to create an opportunity for feeding the economy with increased alcohol and paper goods sales. Keeping the American spirit of making much ado about nothing I have renamed my Marguerita the Concetta Conseula de Mexico, which literally translates to Connie Connie of Mexico. Hey why not? I love my neighbor Connie, she is Italian but on the 5th of May an honorary Mexican like the rest of us and since there is no current holiday honoring her presently that I know of, hey why not, she deserves it! Besides I can’t be reprimanded for mixing up a drink incorrectly that I concocted on my own. I do want to note that if you are not a mixed drink fan then you may want to try a “Bebida de no memoria” (literal translation ~ “Drink of no memory”) otherwise known as TEQUILA! I hope you take time to celebrate Cinco de Mayo this weekend or any other made up holiday! Laughter and good company are great medicines. And as always remember “Treat your family like friends and your friends like family”. I have written this recipe in “parts” so you can reduce or enlarge for whatever size crowd you are entertaining. 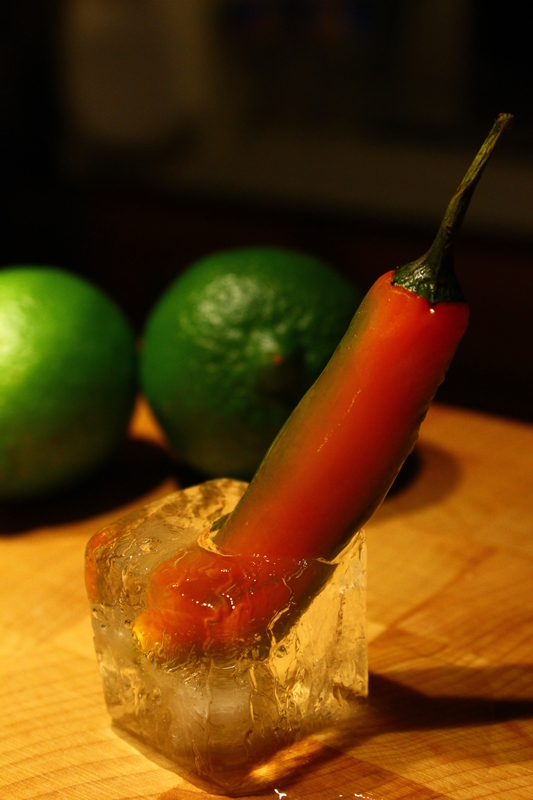 In addition, under the recipe I shot a close up of the garnish I used, a chili pepper frozen into an ice cube so when you place it on top of the contents in the glass it stays in postion and doesn’t sink to the bottom. A batch of these can be made well ahead of time for dropping in at the last minute. 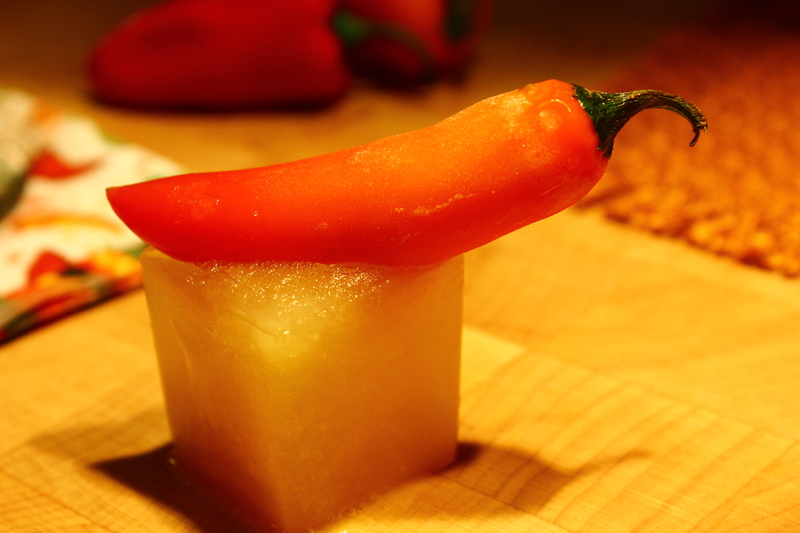 Freeze some peppers into your ice cubes for garnish. Freezing flavored soda or fresh juices helps keep drinks full of flavor when the ice starts to melt. 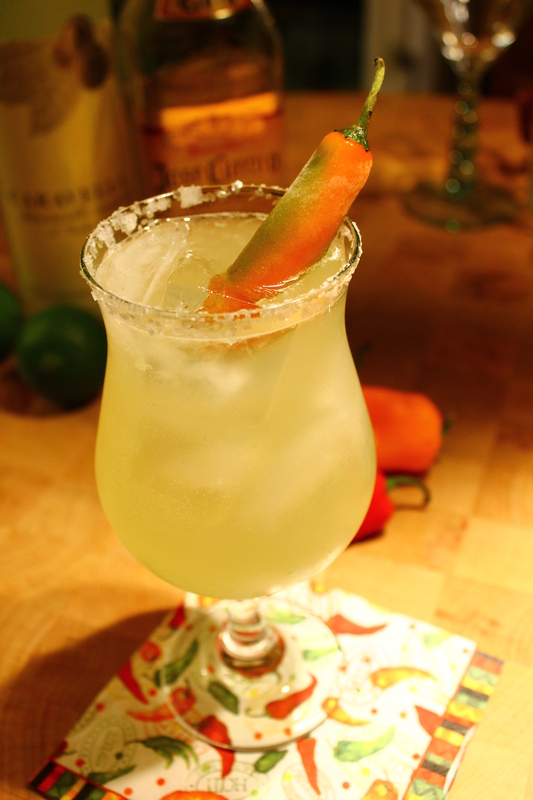 Aside | This entry was posted in Cinco de Mayo, Cocktails, Family, Food, friends, humor, Mexico, Recipe, Uncategorized and tagged Cinco de Mayo, cocktail, entertainment, family, food, friends, how to, humor, instruction, Mexican, Mexico, recipe, recipes. Bookmark the permalink.